The National Water Commission (NWC) is undertaking work to advance urban water reform in Australia. 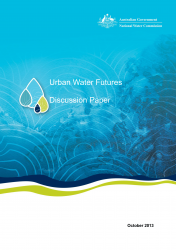 As part of their engagement with stakeholders, they issued the Urban Water Futures Discussion Paper in October 2013, and invited organisations and people to make submissions. This discussion paper complemented the issues paper for the National Water Reform Assessment: 2014 (triennial assessment) call for public submissions. Submissions to the Urban Futures Discussion Paper are published with the triennial assessment submissions and can be found on the NWC website.